Moving is rarely considered an enjoyable or relaxing experience. There's the planning, the packing, the hauling, the unpacking, the misplaced or missing items, the chaotic clutter of boxes; the overall stress can overwhelm even the most easygoing person. But, does it have to be that way? For almost twenty-five years, Regina Leeds has helped her clients prepare for new spaces with practical support and a fresh perspective. She sees moving as an opportunity to start fresh, downsize, and simplify. 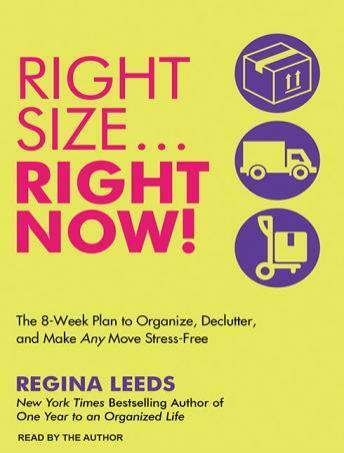 In Rightsize...Right Now!, Leeds outlines her eight-week plan to clear clutter, organize, and relocate without stress. From making a plan and taking the first steps to addressing unmade decisions and final details, Leeds turns the stress of moving into the excitement of a life-changing opportunity.